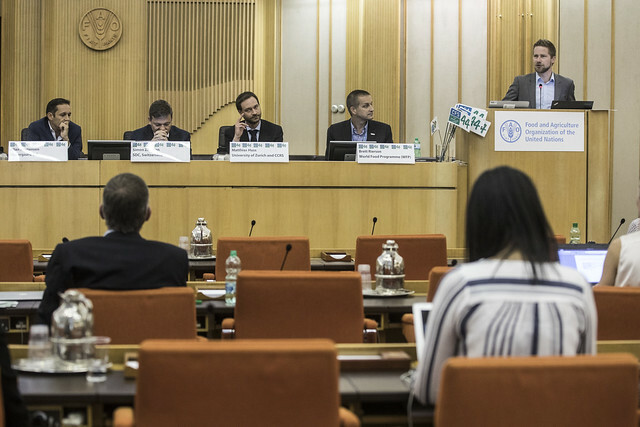 The side-event allows participants to learn about recent experiences and innovations in reducing grains post-harvest losses, and the leverage they present in achieving the sustainable development agenda. Panelists and presenters from CFS member countries, UN bodies, civil society, private sector, and academia will analyse and share solutions in making reducing post-harvest losses work in policy and practice. The event further serves as a platform for participants to identify synergies with ongoing projects, and to announce and inform about new initiatives and projects. Panelists and presenters from CFS member countries, UN bodies, civil society, private sector, and academia have analyzed and shared solutions in making reducing post-harvest losses work in practice, policy and research. Overall, speakers emphasized that the practices and storage technologies to dramatically reduce post-harvest losses are available and that they have proven to effectively reduce losses. Yet, bringing these practices and technologies to scale will require strong and continued efforts and investments. To bring practices and technologies to greater scale, a key role is seen for working with the private sector – both for innovations such as bringing down costs for hermetic storage bags, but also for reaching more and more farmers, for example by integrating agro-dealers and farmer organizations in outreach programmes. At the same time, political commitment at all levels is needed to leverage innovations and drive scale. Presenters further stressed that more should be done to assess and share results on post-harvest loss reduction efforts, and that robust evidence on the socio-economic impacts of post-harvest losses, for example on farmer’s food security and income, will help to make informed funding and programmatic decisions. Suitable practices and storage technologies for reducing post-harvest losses are available and have proven to be effective. All stakeholders have an important role to play in bringing post-harvest loss practices and technologies to scale, a process that will also depend on conducive political commitment at all levels. Achieving results, testing approaches, and assessing and publicizing impact, will all be critical to keep the topic of post-harvest loss high on the agenda of donors and other stakeholders. Scaling-up of post-harvest loss reduction practices and technologies will require strong and continued investment to drive demand and supply at the same time. Assessing results of post-harvest loss reduction, conducting research on the impacts, and sharing results widely are important to keep the momentum. Achieving the SDG target on food losses will require a long-term engagement and efforts from a diverse range of partners, in order to achieve sustainable impact.